This is the kind of family-friendly, “feel-good” story we like. 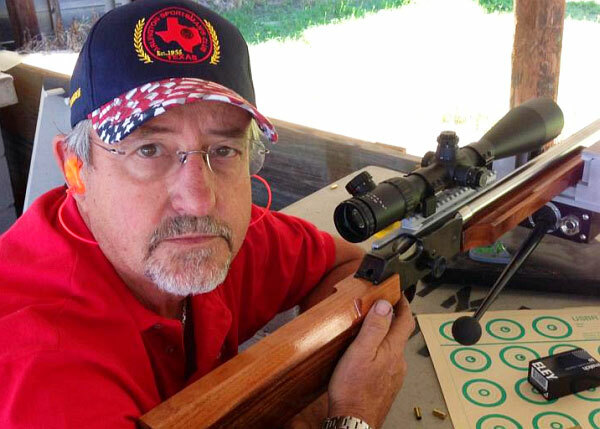 Texan Richard King created a rimfire benchrest rifle using a classic Martini Mark III smallbore action. He fitted the gun with a new flat, wide forearm and a new buttstock, allowing the gun to sit steady on the bags and track smoothly. The narrow action was also fitted with a cantilevered top rail to hold a high-magnification scope. Here is Vicki King, with Martini Mark III and her trophy. But here’s the best part. Richard provided this updated classic to his wife Vicki, who proceded to win a rimfire benchrest match (Vintage class) with the old Martini. 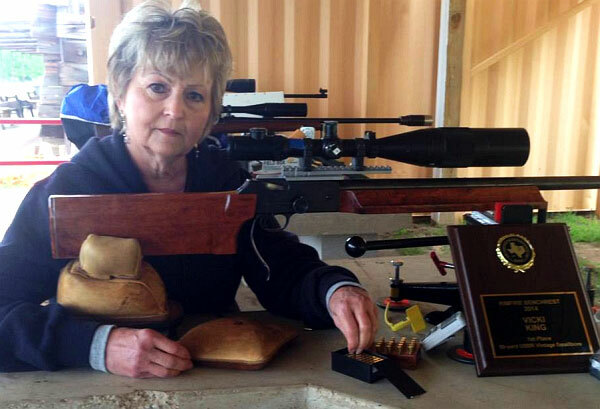 Richard reports: “Here is my lovely wife with her High Overall Vintage trophy. That is a Martini Mark III that I re-stocked in walnut for 50-yard, .22-caliber benchrest matches. It’s great to have her shooting with me again.” FYI, last summer Richard and Vicki celebrated their 50th wedding anniversary! Bravo Richard — kudos to you AND to your lovely bride. It’s great to see a couple shooting together. It’s also great to see a classic rifle brought back to the winner’s circle with some inspired stock-work and other upgrades. Here is Richard King, with his handiwork — an updated Martini Mark III smallbore rifle. Share the post "Texas Twosome: Mr. and Mrs. King Enjoy a Martini Together"
In a major victory for firearms and ammunition retailers, a Federal District Court in Colorado has thrown out a Brady Center-backed lawsuit arising out of the Aurora, Colorado, movie theater shooting. The Federal Court ruled that: “The federal and state immunity statutes prohibit the claims of liability for the sales of ammunition in this case.” If you are involved in sales of guns or ammunition, whether as a distributor or retailer, we strongly recommend you read the entire U.S. District Court decision by Richard P. Matsch, Senior District Judge. The Judge’s memorandum cites many important principles of law. CLICK HERE for Dismissal Order. The case, Phillips v. Lucky Gunner, was brought by the parents of an Aurora shooting victim against several web-based businesses from whom the shooter, James Holmes, purchased materials. The plaintiffs sued two web-based ammo vendors, Lucky Gunner LLC and The Sportsman’s Guide, as well as suppliers of various tactical gear. Brady Center lawyers representing the family members alleged that the Internet business practices of the FFLs did not include “reasonable safeguards” to prevent persons such as Holmes from purchasing their respective products. The court found that the Protection of Lawful Commerce in Arms Act (PLCAA) as well as a Colorado preemption statute required dismissal of the Brady Center’s lawsuit. In dismissing this action, the court followed legal precedents that have consistently found the PLCAA to be constitutional. The ammunition sellers are also protected by the Protection of Lawful Commerce in Arms Act, 15 U.S.C. § 7901 et seq. (“PLCAA”). Enacted in 2005, the PLCAA generally prohibits claims against firearms and ammunition manufacturers, distributors, dealers, and importers for damages and injunctive relief arising from the criminal or unlawful misuse of firearms and ammunition, unless the suit falls within one of six enumerated exceptions. 15 U.S.C. §§ 7901–7903. The Colorado legislature specifically limited suits against ammunition sellers to those where the plaintiff requests “damages” for relief, except in a product liability action which includes “any remedy.” Section 13-21-504.5(1). Subsection (2) precludes liability of the ammunition sellers for the actions of Holmes in any type of action. The plaintiffs’ claims of negligence, negligent entrustment and public nuisance based on the sales of ammunition to Holmes are barred and “shall” be dismissed. C.R.S. § 13-21-504.5(3). Story based on report by NSSF.org. Share the post "Federal Court Dismisses Aurora Case Against Ammo Sellers"
Here’s a clever new product from Birchwood Casey, makers of Shoot-N-C targets. The innovative, spring-loaded “Belly Dancer” target moves when hit. This does the duty of a gong at a fraction of the weight and cost. The Belly Dancer is handy, easy to transport, and affordable ($34.07 at Amazon.com). What’s the down-side? Well, eventually you’re going to hit those springs and they will need replacement. Also, while the polymer target zone can withstand hundreds of shots, it will not last forever. The new Belly Dancer Target employs springs to move back and forth when hit. The 9.5″ x 6.5″ yellow target section is made from a self-healing polymer that can withstand hundreds of hits. Designed for use with any caliber from .22 up, this Belly Dancer target doesn’t “clang” like a gong but the waiving motion indicates a hit. Shoot the neon-yellow gong-shaped head by itself or add stick-on 6″ Bullseye targets for precision work. This Belly Dancer target system works well as long as the ground is relatively soft. In rocky areas you may have trouble inserting the support shafts. But we still like this new product. 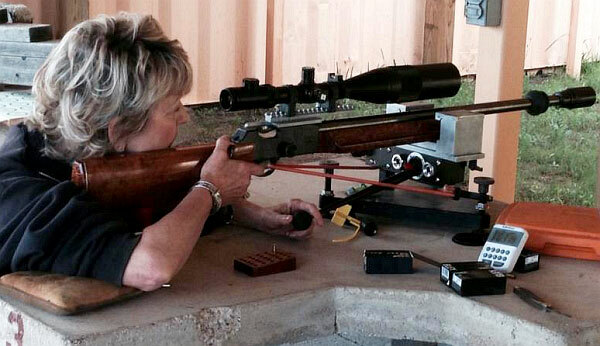 It’s great for rifle practice at 300-600 yards. – Yellow Hit Zone measures 9.5″ high and 6.5″ wide. - Metal stand is 14″ high. - Includes twelve 6″-Diameter Shoot•N•C Targets. Share the post "Spring-Loaded Belly Dancer Target Moves When Hit"